Character design different ethnicity male heroes tutorial. This post is my attempt to sketch and paint a character concept of male hero archetype with different ethnicities or nationality. So far I art about four hero characters and I mainly paint focusing on just facial features. If you paint a lot of portrait with variety of ethnicity, then you will probably know that the facial feature are not that much different. 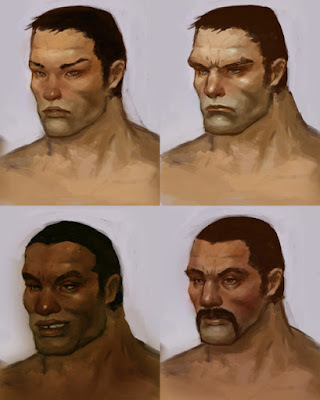 Once you know where to to make changes, you can easily paint over your white guy to be Asian or black or anything. It does not take much to change one facial feature to another. In this concept art, my intention is to create the same type of super hero with variety of races. A lot of viewers often ask me how come I don't paint a lot of black guy, Latino, etc. I actually do if you look at all the post in the blog, there are plenty of them. But most of the time job requirement make me lean toward the majority. Also most of the models I paint in life session are Caucasians, males and females. Anyway, this was really fun for me. Character Style faces concept art tutorial. Below are bigger for one of each.